It has been a fast and furious week. Just way too much going on and trying to rest my foot at the same time. Hmmmm doesn't really work. LOL I had a wonderful interaction with Monica from Nature Footstep we started chatting about the balloon art and leather. We both prepared some leather then balloon painted it. Mine turned out more abstract, which is what I am and from that I am making leather flowers to go into a leather flower bouquet. 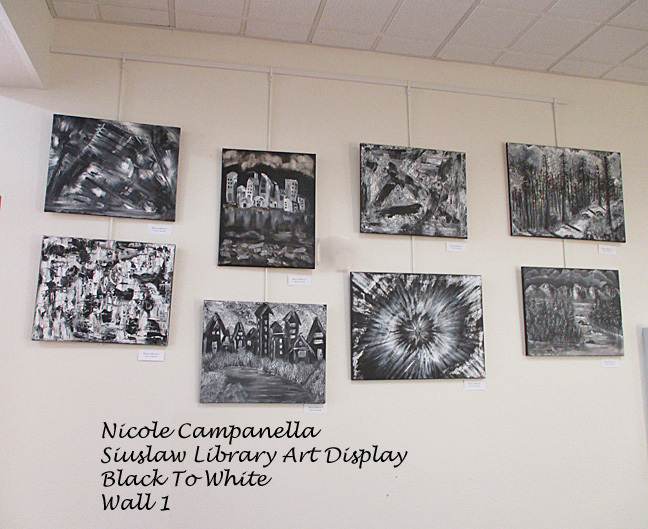 This is the Black To White display at the Siuslaw Library here in Florence, OR. It looks more dynamic in person. The lighting is awful in the library. I hope you enjoyed the art and I look forward to seeing yours. 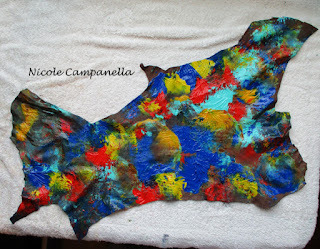 I am linking with Paint Party Friday. I missed you last week Nicole but whatever you have done to your foot I wish it a speedy recovery. I'm sure all the rushing around this week has taken your mind off what ever the problem/pain is. Lots of beauty to look at today, fabulous sculptured leather flowers and I always adore your precise beadwork, such a good eye with you pattern, a lot more neat than I could ever be. Your monochromes are one big happy family hanging together. Magnificent display, I'm so proud for you. Your leather art is stunning. Love the necklaces! Thanks Monica. Just wanted to mention that the beadwork is actually not heavy at all. Hi, Nicole. Sorry to hear your foot is still giving you bother. You've made the most of your time, though. These pieces are wonderful. Balloon painting produces an interesting effect! Too bad about the lighting at the library but at least people are seeing and enjoying your work! Such gorgeous work you do Nicole! wonderful variety of projects Nicole. Always fun to try new things isn't it. Gorgeous beadwork!! Happy PPF! Beautiful artwork. I love the beaded necklace. 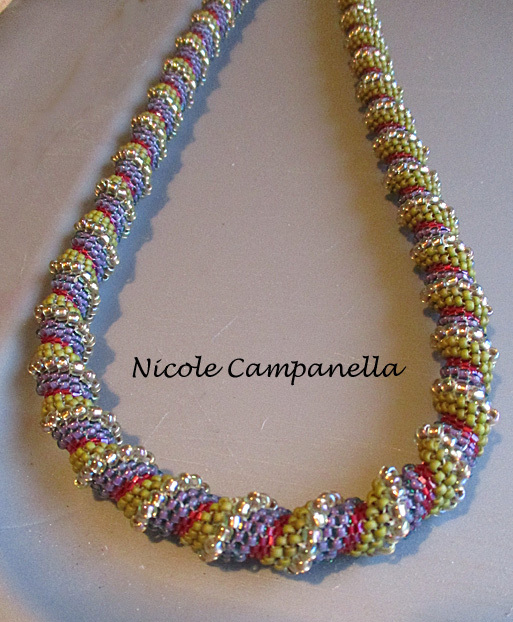 I do like the look of your beaded necklace, nice colours. 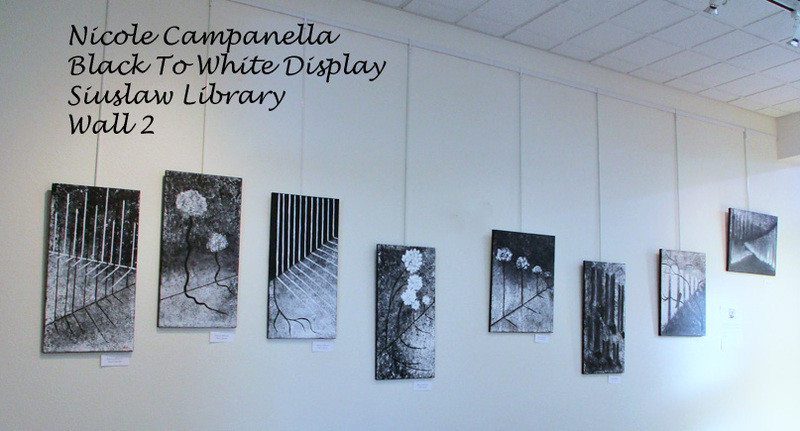 Your exhibition walls look very good. Take care, hope your foot heals quickly. Hope your foot gets well!!!!!!!! I love that leather flower! It's amazing! Speaking of amazing, your bead work is breath taking!!! I love the way your art looks! Wow! So happy for you, with the display at the exhibition! Take Care of your foot! Big Hugs! 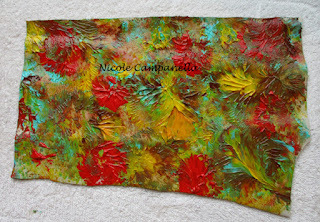 Hi Nicole, I didn't make it to PPF this week but am popping in to see your art and, wow, I was knocked out. 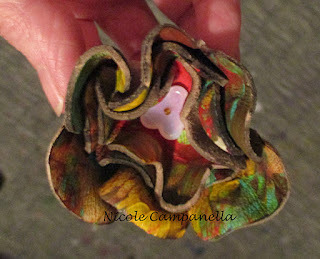 The leather flower you made is fabulous and your beautiful necklaces and so wonderful! Thank you everyone for all of your nice and encouraging comments. 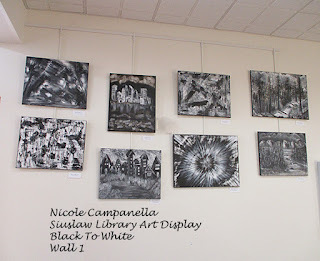 The black and white paintings look gorgeous! 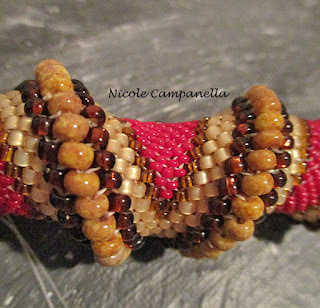 I am so glad that you're able to bead again, you do very beautiful works. The colorful leather makes such a cool flower! Also love the brown and red jewelry. What a fantastic selection of amazing projects Nicole! Fabulous! You are such a talent! You are so talented, beautiful work! Hi Nicole! Beautiful artwork, I especially love the necklaces. And thank you for entering the giveaway at MagicLoveCrow. Best of luck!